Roadsides, railroads, fields, sandy open ground, disturbed places. 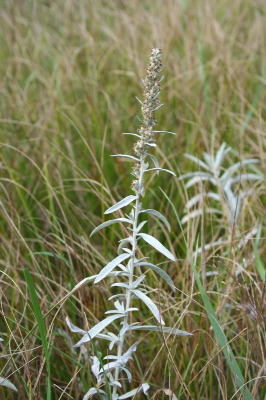 Usually considered native on prairies and dry soils from Wisconsin and Illinois westward. A collection in 1989 (MICH, UMBS) from a prairie-like community along the Menominee River in Menominee Co. may well be native (as also, without habitat, an 1839 Menominee Co. collection by Douglass Houghton). Most of our occurrences are surely adventive from the West. This is an even more variable species farther west, but our specimens also differ considerably in lobing (if any) of leaves, though our plants are apparently all subsp. ludoviciana [var. pabularis (A. Nelson) Fernald]. MICHIGAN FLORA ONLINE. A. A. Reznicek, E. G. Voss, & B. S. Walters. February 2011. University of Michigan. Web. April 21, 2019. https://michiganflora.net/species.aspx?id=238.